The perfect choice for modern, architectural bathrooms. Like all GROHE shower systems, it is easy to install and packed with great technology. 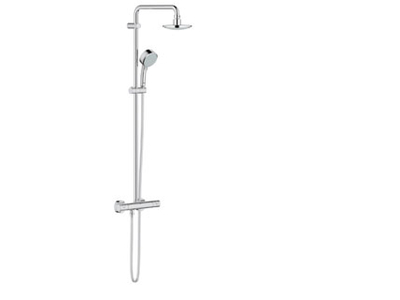 The 160mm head shower can be swivelled to create the perfect angle while the hand shower features two spray patterns including the new air-infused GROHE Rain O2 spray. GROHE DreamSpray® creates a perfect spray pattern to ensure maximum showering satisfaction. The thermostat's GROHE TurboStat® technology means you can take a luxurious shower secure in the knowledge the water will stay at the pre-selected temperature even if the water pressure changes.